Pellet stoves are heating devices that replace or supplement furnaces and wood-burning stoves. They are a newer technology invented to attempt to find a solution to the problem of fossil fuel dependency. Pellet stoves resemble wood-burning stoves, but they burn pellet fuel. The fuel is compacted from sawdust, leaves and other biomass such as crop waste or recycled paper. The pellets are sold in stores, but you can also buy a pellet mill and make your own. The mills are very expensive but can help you reduce your heating fuel costs over time. Using recycled paper for pellets is also effective in reducing landfill waste. 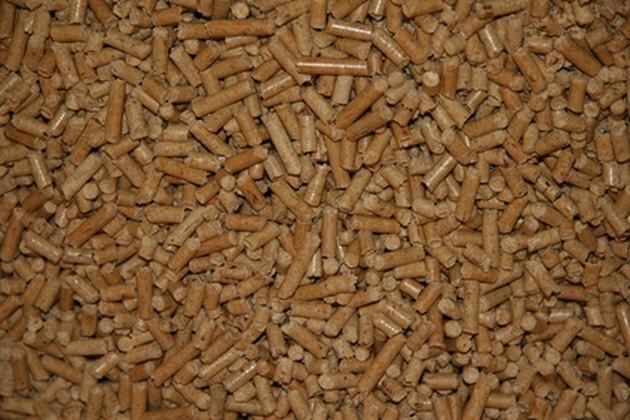 Pellet fuel for pellet stoves is composed of wood, paper, biomass or crop waste. Collect the paper to make into pellets. Use recycled paper such as newspaper, pizza boxes, junk mail and old documents you no longer need. Tear the recycled paper into pieces small enough to fit into the hopper of your hammer mill. Place a box under the chute of the hammer mill. Turn on the hammer mill, and slowly feed the paper pieces into the hopper. Shredded paper will fall into the box under the chute. Place a bucket below the chute of the pellet mill. Turn on the pellet mill, and slowly feed the shredded paper into the hopper. In a few seconds, pellets will begin to come out of the chute and fall into the bucket. Continue the process until all the shredded paper is gone. Repeat this procedure periodically to use all your recycled paper. What Kind of Paper Can I Burn in My Fireplace?